Game jams hold a very special place in my cold, black heart. Thanks to them, I found out about some great people whose work has given me great pleasure over time. In mid-december, Ludum Dare 22, the 22nd edition of everyone's favourite 48-hour game jam, came to an end. A couple of weeks ago, the winners of the wonderful game-a-thon were announced. I've been glancing their way ever since, and have finally found the time to give them a proper look. Results ahead! Frostbite, by one Pedro Medeires, is a story about a lonely soldier battling his own ominous thoughts during a nuclear winter's eve. His wife left the watchtower in search of supplies, and never came back. Plagued by hallucinations and burdened by worries, he leaves his post in search of her. The writing is appealing even if a bit too dramatic for my taste. 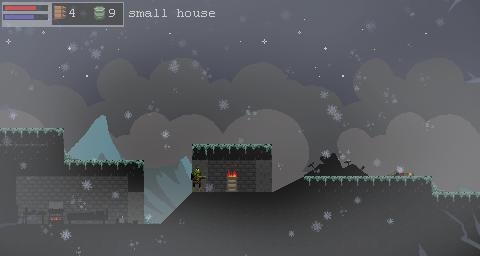 The game features a nice hunger/tiredness/cold mechanism, which forces you to ration food, and constantly look for a place to sleep and warm yourself up. It creates an atmosphere of constant pressure, since ammo and provisions are scarce, and beds are few and far between. Sébastien Bénard has quite a track record with Ludum Dare, so I was eager to see what he did this time. Last Breath is a "story of a dog trapped between life and death". Fluffy, the aforementioned dog, gets hit by a car while chasing a ball. He then falls down a hole and has to find a way out. Things go from bad to worse when Fluffy's evil shadow self appears and tries to stop him from doing that. The game centers on avoiding the nimble anti-Fluffy all the while collecting shiny red balls. The level design is interesting and the controls are smooth, but the whole thing is so frustratingly hard that I started losing hair at an alarming rate. Nonetheless, it's well worth a try, especially if you have more patience or platforming skills than me. Andrew Sum's Stray Whisker opens up with a scene in which a girl begrudgingly leaves her cat in the street. The player assumes the role of the abandoned creature, and guides it thorough the city, in search of companionship. Traversing parks and residential areas, The Cat meets other felines, but finds that their company can sometimes be more of a bother than expected. This makes for some lovely platforming opportuninites, which didn't go to waste. Surprisingly, in contrast to the theme, the atmosphere is extremely light. Jolly at times, even. The ending is somewhat anticlimactic, but one can let it slip in light of... well, everything else. The minimalistic genius that is Jonathan Whiting once again lives up to expectations with Craequ. It is a figure-em-out puzzle game, of which I'll say nothing more, in fear of mechanical spoilers. Go play it. Friedrich Hanisch's tongue breaker Soliloquy tackles the notion of being alone but not quite, using the premise of "having two souls" as an euphemism for not being quite right in the head. The game has you controlling two halves of the same person alternately, with puzzle design revolving around the notion that each one has unique abilities. Those abilities are not numerous, but the intent is clear. As you switch back and forth between souls, the point-of-view shot of the passive soul lingers on screen, making it difficult to discern the active reality from the passive one. Both clever and vertigo-inducing. Perhaps the most moving game of LD22, and definitely one of my favourites, is Pierre Corbinais' Never Alone Hotline. It plays like a visual novel, with a set ending and many paths leading up to it. The story centers on Severine, a girl working a hotline for lonely people. Through encounters with different people on the job, she slowly learns about herself. It is a very powerful and emotional story about modern day loneliness, and trying to figure out what it is, finding out how to fight it or cope with it, and it conveys it's message clearly despite the language barrier (the author is French, and his English is not too good). The dialogue is riddled with humour, and there are a few lovely meta moments, which make the game even more profound. Farrokh is worth mentioning for the sheer madness of it, if nothing else. 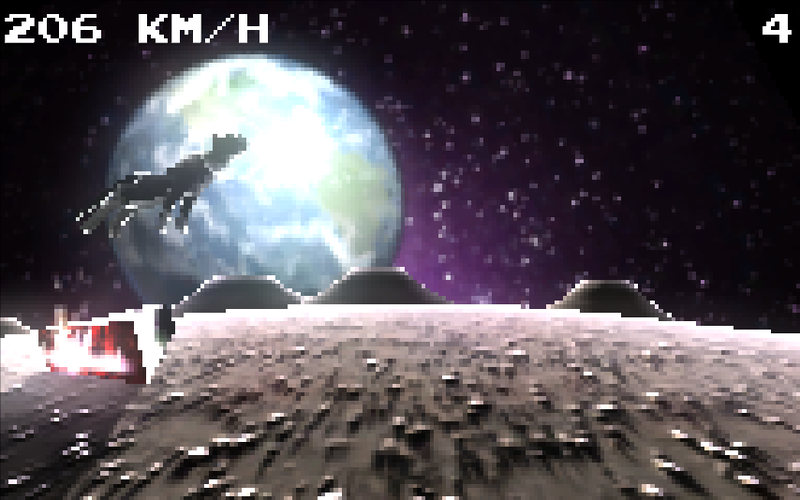 The titular character is a space cat stranded on the Moon. He needs to run as fast as he can, avoiding debris from the ship, until he gains enough momentum to leap and leave Moon's orbit. Sadly, the game is rather short and easy to finish, but the premise is worth a giggle. Steven Lavelle's entry is bound to make you sad. Puppy Shelter is a rather unique puzzle game that pits you, the trainer, against a kennel of puppies in need of manners. After you manage to teach them how to behave, the shelter opens for business. Sadly, not one puppy gets taken away, so you need to put them down. One by one. And then you do it all over again. And never does a single dog leave with a new owner. No matter how well behaved, or cute they are, no one ever takes them home. In the end, nothing you do matters, and you are left alone and utterly devastated. There are a few games that caught my eye even though they haven't made it into the Top 50, like Bennet Foddy's Down A Well, Stephen Murpy's Drill Killer and Nikolaj Kaminski's Afrocity Atrocity. As for the finalists, I'm not one to scream bloody innovation, but most of them were merely brushing against the theme, instead of trying to explore it. I guess that's why I don't like broad themes, like "Alone". In theory, they should bear more diverse fruit, but it's far too easy to put anything under that label. Almost any given single player game qualifies, in a way. Nevertheless, it was a good run. Let's just hope the community votes for a more focused theme next time.